Why not give your faithful friend a treat in one of our 2 dedicated Dog Wash bays? 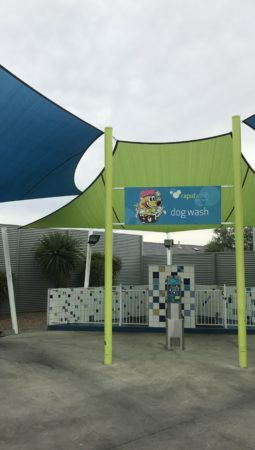 Each bay is enclosed by modern pool fencing and is fitted with the latest technology available to make your dog’s wash experience as enjoyable as possible. If it’s shampoo, flea rinse, conditioner or disinfectant you need it is all available delivered through a “soft wash” gun with warm water that is seasonally adjusted in temperature. To complete the experience, give your dog a nice “blow dry” and take your pet home clean, dry and smelling like a rose, with a tail wagging in delight! !